I am calling this a "Tricknique." Maybe do I have to talk about the quilt? It has been hanging out for a while, and keeps being pushed back behind every new project, and while there is a good reason for that (several, probably?)... but there is one really good reason that I can't do most of the cutting now, which is that I don't want to do it by hand, so I am waiting for sizzix to relist a die that is currently out of stock (and I have talked to them, and it will be available eventually, but! the! wait! is! hard!) And I feel sad about the project that I was so excited about become less and less exciting the more it's shoved into the corner. So, starting this week, I've been putting a little work into it, hand cutting a few pieces here and there (mostly, it's the border that will require the die) to see some progress and to remind myself how awesome this will be when finished (even if that is a long time from now). 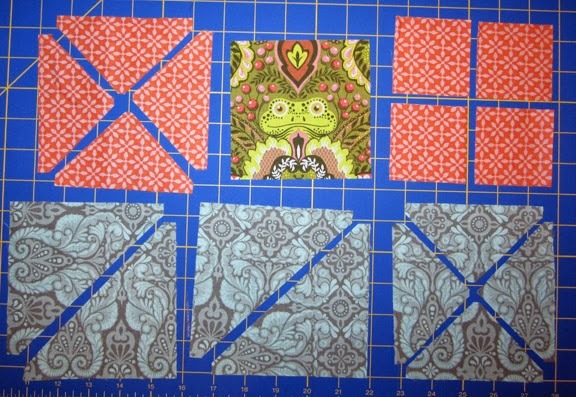 I've also cut many quarter and half square triangles using my sizzix, for quarter square and half square blocks, and I totally realize this would make a ton more sense with pictures... but that's not happening, I want to save this quilt for the big reveal. 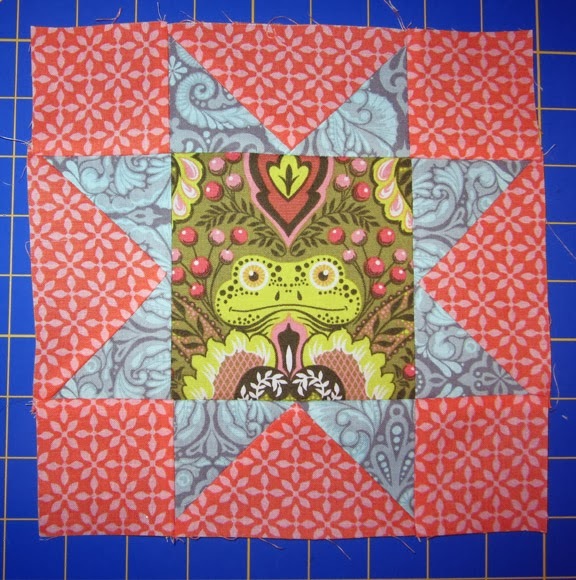 I decided to make one whole block, and it involves a star,* so I looked at my scrap pile, and my squares and my piles of triangles, and thought, hey, I can just piece the arms of this out of triangles! Because I cut so many triangles, many more than I will ever need (unless I make three of these quilts), because I totally love! love! running fabric through my Big Shot. 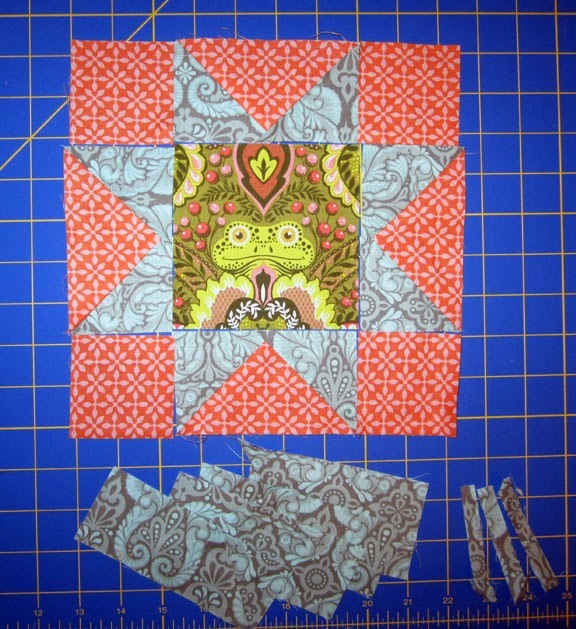 And after I pieced like five of these, I realized what I was making were flying geese, and I thought probably no one pieces flying geese like this, and I'm not sure why you would, except if, like me, you had a surfeit of various triangles to start from. You will need: 8 quarter square triangles (finished size 41/2") - 4 in the outside color, and 4 in the inside color, 1 4 1/2" center square, 4 2 1/2" corners blocks, and 4 large half square triangle blocks (these are 5" finished, but, you could use any size that gets you past the seam allowance. Which means it must be at least somewhat larger than your quarter square triangle. 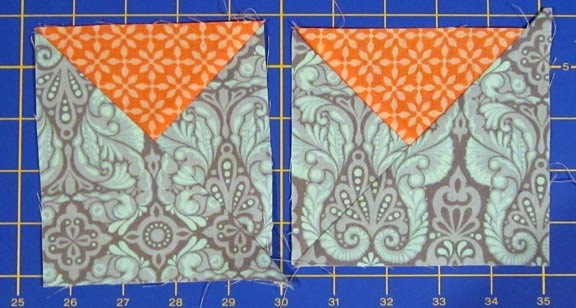 1. piece your quarter square units, each to its opposing color. Press. 2. piece your half quarter squares to your half squares. Press. Because mine is larger, it doesn't matter which side I line it up with when I sew it; the excess will be cut off later. But if yours is smaller than the half quarter triangle, you need to match the orange side, okay? 3. Trim the units down to 2 1/2 x 4 1/2". 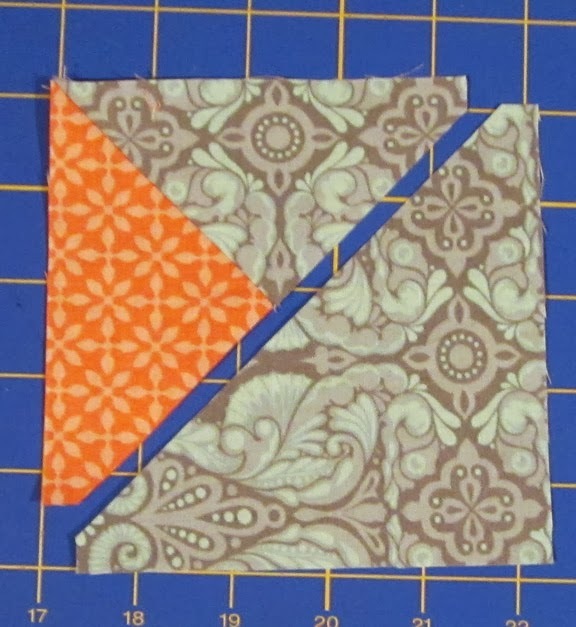 Line your ruler up on the base of the orange triangle, and you should cut 1/4 past the point. Now you have geese! 4. And assemble your block from there. It's an 8 inch star, when finished. At the bottom are the cut off pieces. 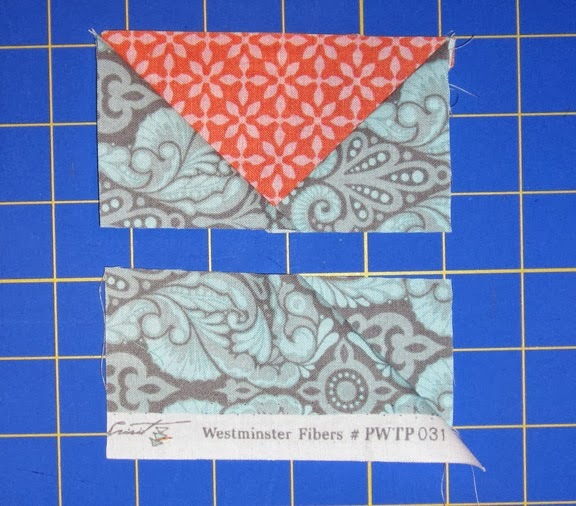 I've been cutting my scraps into 2" squares to piece a 6" version of the same star, for which I will make flying geese in a less ridiculous manner, so maybe it is not so wasteful after all? * I don't know if this star has a name. I think of it as "the basic star." It is at least the basis of or a variation on the sawtooth star. *** Edited to add: here is a much more sensible approach for die cut geese from VeryKerryBerry. And so on - more on scrappy plus blocks.